Quality Management System is certified to ISO 9001:2015. The environmental management system of the company is certified according to GOST R ISO 14001:2016. 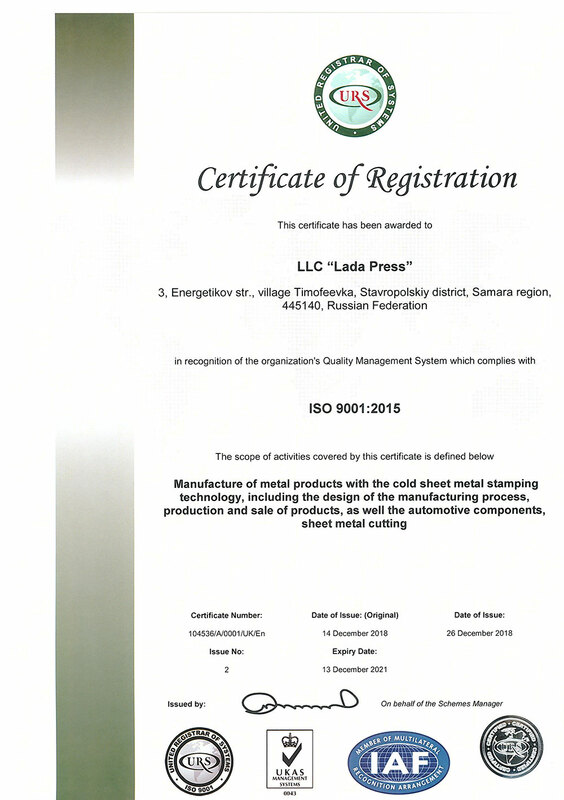 "Lada-Press" has appeared in the Russian market in 2001, since then the company could confirm the reputation of a reliable manufacturer of high-quality automotive components by cold stamping. A strong technical infrastructure ensures the fabrication of first-class products. At the moment the company has stamping equipment with includes the various Presses from 100 to 1000 tons. As well as, the company disposes of various machining and metal-cutting equipment, allowing to produce, repair and maintain the die equipment in a good working. As a consequence, there is a possibility to work up more quickly for the new products, reducing the time of industrialization of new parts. The company introduces in operation the advanced equipment for optimization of technological processes and the most efficient production management. Aimed to measure up of exacting product standards of clients, "Lada-Press" is going to acquire the automatic presses and fine blanking machines, as well as to purchase cutting equipment to better repair and manufacture of die tooling. The studies of designing and construction of a new modern painting shop for components are started. Currently, the company employs about 170 employees. Each of them is highly skilled specialist, professional with extensive knowledge and experience in the manufacture of stamping products. Since 2013, we entered into direct contracts for suppling of rolled metal from the biggest metallurgical plants in Russia: JSC "Severstal" and JSC "Novolipetsk Steel", whereby “Lada-Press" ensures low cost and the quality of the raw material. For suppling of stainless steel, our company is working with the importer LLC "Ferrit" - distributor of high-quality Korean metal. Our company is glad to cooperate with new partners for stamping products and the purchasing of high-quality rolled metal (raw materials). In the development of new projects, we are ready to consider all the client requests and to look for new technical solutions together with your experts.